When a young man committed suicide in 2005, in the remote community of Lajamanu, local Warlpiri elders said ‘Enough is enough’. Decades of western medical intervention had failed to stop indigenous suicides and, in 2005, Lajamanu’s elders took matters into their own hands. 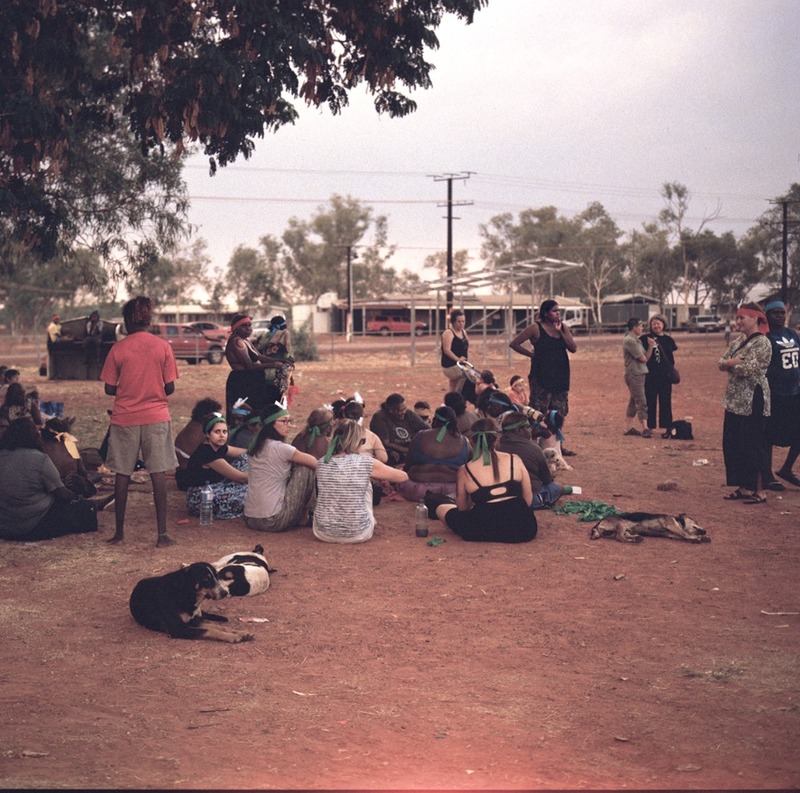 With help from friends, Lajamanu established Milpirri festival to spread the traditional ideas of ‘Kurdiji’ among their young people and to foster a sense of belonging. They began to fight for every single young indigenous life in their community. Now those same elders want to bring Kurdiji into the digital age, with a community created app based on stories, ceremonies and law. They want to fight for all aboriginal lives, not just those in remote or traditional communities. They have partnered with an expert team including technologists, photographers and a leading clinical psychologist from The Black Dog Institute. Kurdiji 1.0 has closed its crowdfunding campaign now and thanks everyone who helped out! But there hasn’t been a suicide in Lajamanu since 2005. The ideas of Kurdiji belong to an initiation ceremony of the same name. For most of Aboriginal history, these ideas were only accessible through Kurdiji ceremony or directly from elders in community. Warlpiri people are changing their laws, giving wide public access to these ideas for the purpose of saving lives. The creation of the Kurdiji 1.0 app represents a turning point in Aboriginal Australia and, we hope, will result in similar projects being launched in the future. Using audio recordings, video and text, Kurdiji 1.0 will provide some of the cultural nourishment provided by initiation in community. The app will reach out to young people who can’t live on country, or who feel cut off or isolated. By reconnecting people with language, skin name, ceremony and law, this app will increase resilience by creating a sense of belonging. Kurdiji’ (shield) is the Warlpiri word for ‘shield’, and it also means ‘to protect’, ‘to ward off’ or ‘to block’. 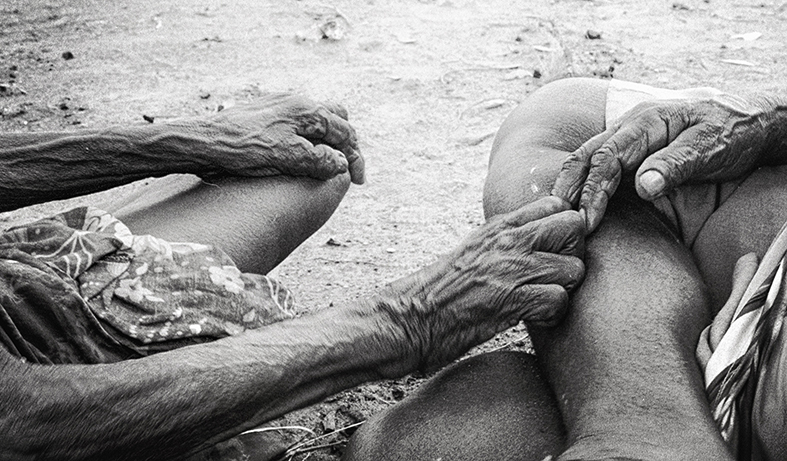 ‘Kurdiji’ is also the name of certain initiation ceremonies for young women and men. These Kurdiji ceremonies teach young people about skin name, ceremony, language and law. The basic principle of Kurdiji is that if ceremony, skin name, language and law are strong, then the individual is also strong. In this diagram, you can see the four pillars and, in the centre, ‘land’, or ‘home’, which is also the person themselves. Kurdiji guards against youth suicide by reinforcing high self-worth before suicidal thoughts occur. It is the shield that keeps young indigenous people safe from the problems of living in and around white society. Kurdiji connects people to their culture, their community, and country. Kurdiji teaches us to relate to each other, to the natural world and to other creatures we share the earth with. It teaches us how to care for country, how to talk to country, and how to listen when country talks back. The Kurdiji 1.0 app will provide a parallel approach to treating depression and suicidal thoughts by non-indigenous means. It aims to build people up before mental health issues become a problem – it will be a shield for people. Who is creating this app? 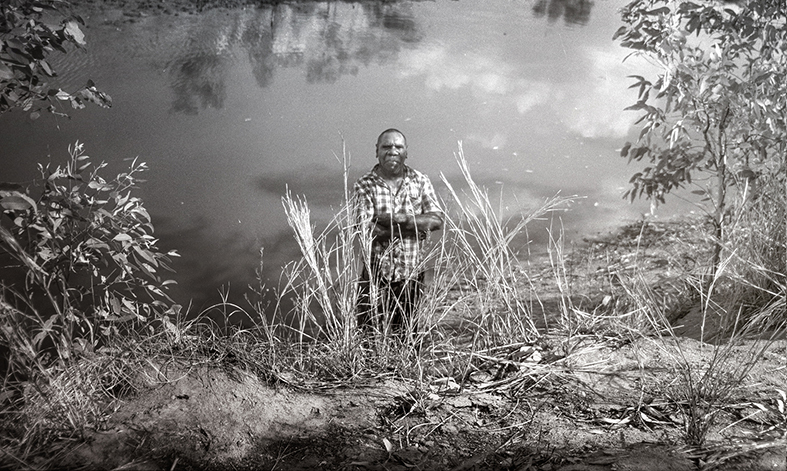 Kurdiji 1.0 will be community-led, community-designed and community empowering. Warlpiri communities have a long history of engaging with technology. They’ve recently produced a digital storybook, which communicates their ideas about land management, and have collaborated in the production of a large number of films. Working with others to create an app is just an extension of the Warlpiri way of reaching out to people through technology. Kids from the local community will work alongside the technology team to create the app, and its content, learning technology and digital media skills. 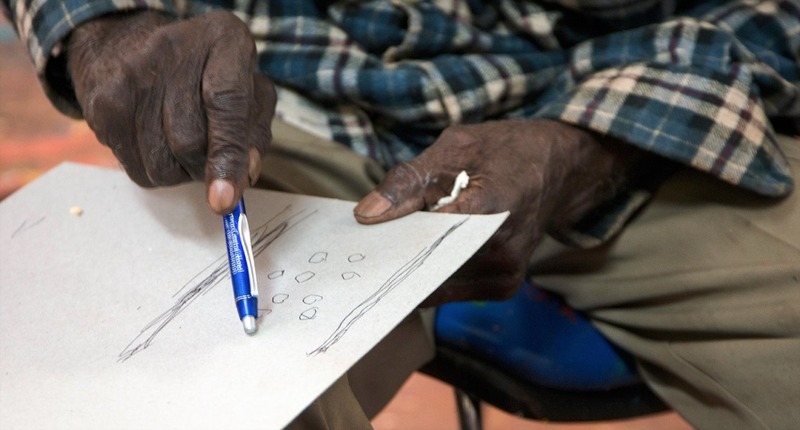 The Kurdiji project will enable Aboriginal elders to trial their own approach to suicide prevention in their own communities. The app is aimed at all indigenous people, regardless of their background, language or community and non-indigenous people can also benefit. While the initial version will be offered in Warlpiri and English language, we hope to create future versions in as many different indigenous languages as possible. We have been fortunate enough to be helped by the marketing team from Flow Hive - Saadi Allan, and Binky Harvey-Jones and Mirabai Nicholson-Mckellar, who have created our amazing video and advised us on all aspects of our public presence. Steve Patrick (Wanta Jampijinpa) is a Warlpiri elder and artistic director of the Milpirri festival of indigenous music and dance. He has been a recipient of an Australian Research Council Discovery Indigenous Fellowship and has taught Warlpiri culture at the Australian National University and other tertiary institutions in Australia and overseas. Steve has published academic papers on Kurdiji ideas and indigenous cultural practice. A highly regarded musician and painter, Steve lives and works in Lajamanu community. Dr Fiona Shand is a researcher and clinical psychologist. Based at the Black Dog Institute, her work focuses on suicide prevention, and particularly on e-health interventions to prevent suicide. She has published extensively in the alcohol and other drugs field and in suicide prevention. Her current research includes a large, community-wide suicide prevention trial being conducted in four New South Wales regions covering a population of 850,000 people. Using an adaptive research design, this research acknowledges the complexity of suicide and uses multiple, integrated prevention strategies. Fiona is also co-designer of an sms-based intervention to support young people following a suicide attempt. This intervention is being piloted in two large public hospitals. Dr Judith Crispin is a Bpangerang photographer and poet. Her work is regularly published in newspapers and journals. She has directed cultural institutions, academic programs and research projects, and has taught in universities across Australia, France and Germany. Judith has written extensively on social justice, art, poetry and music and has regularly engaged the public through talks, symposia, and forums. 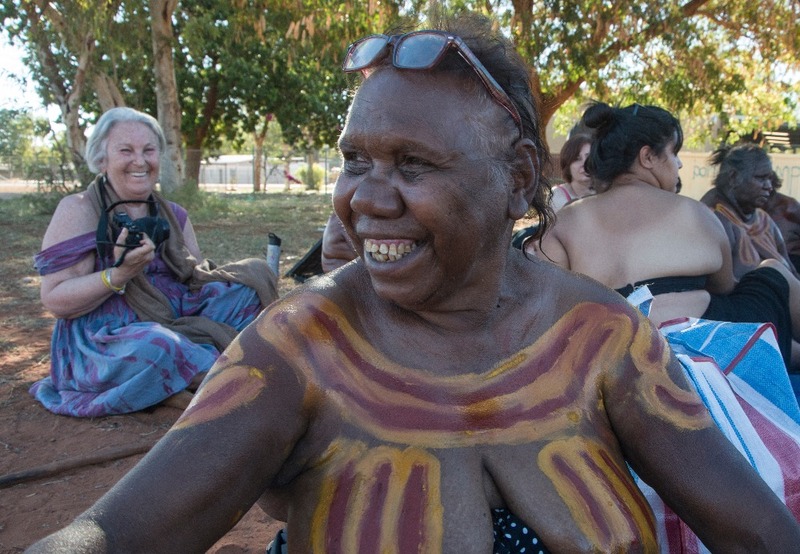 Judith has been working with Warlpiri communities since 2010. 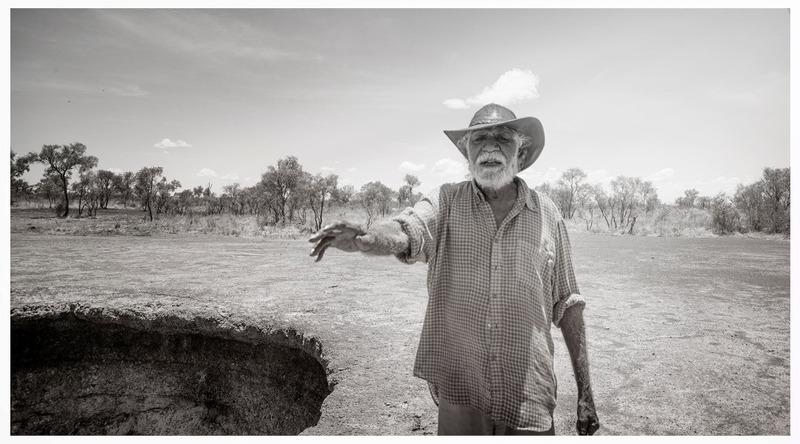 This is the last week of our Kurdiji 1.0 Aboriginal suicide prevention app crowdfunding campaign. It is also reconciliation week! We'd like to express our gratitude to everyone who has donated, sent messages of support, or helped spread the word about our project. We'd also like to acknowledge the Aboriginal elders and non-Aboriginal scholars who have paved the way for this project with their advocacy and sharing of culture. We've sent you some of their words during this campaign and we hope you've found their insights as valuable as we have. Young Aboriginal people are taking their own lives at an unprecedented rate. Our campaign has proven that people all over the world are willing to stand with Aboriginal Australia and fight to prevent suicides. When we began this campaign we couldn't have known that so many of you would support the Warlpiri elders in their efforts to save Indigenous lives. We have raised $117,389 in just under seven weeks, from crowdfunding and philanthropy, but we need to raise another $162,611 to bring the project to fruition. We are very grateful to Sacred Fire Foundation, Australian Communities Foundation and James N Kirby Foundation for their large donations, as well as to those individuals who have given generously. What we've raised so far is enough to start work on the app. On June 10th we will drive, four days into the desert, to Lajamanu community and begin work with the elders. We will be regularly posting images and videos from our work there. But we won't be able to finish the app and get it into the hands of those who need it, unless we reach target. We lose three Aboriginal lives a week to suicide and four out of five of these suicides are children between the ages of 10 and 14. The elders have an answer for vulnerable people but they need to develop their app in order to deliver it. Please share this video widely, even if you've already shared it previously. And let your networks know about the campaign. This week's historic decision at Uluru opened the way toward reconciliation and treaties with Aboriginal Australia. Let's send a message to our elders that Aboriginal lives are important. Let's help realise their dream of an app that reconnects young people with country, culture and community. 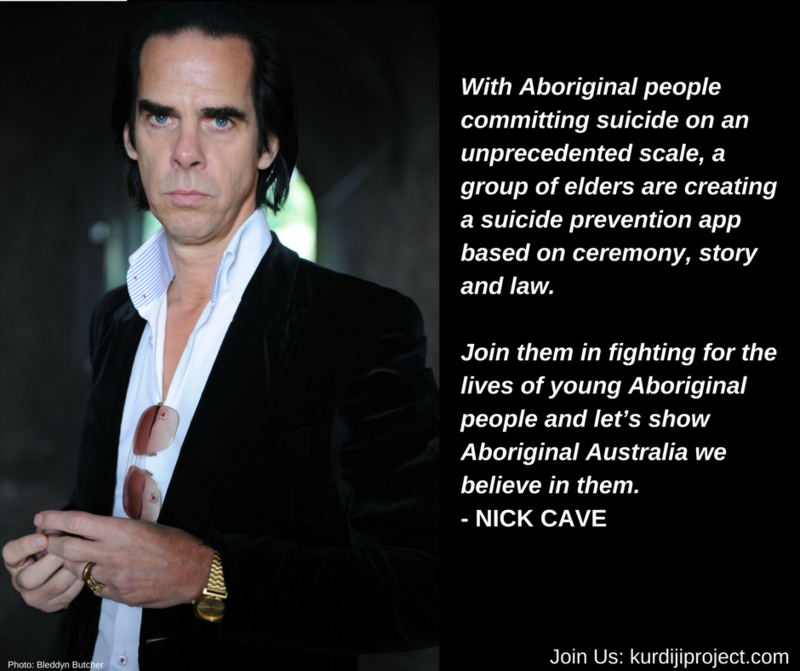 Let's take a stand against Aboriginal suicide in this country. We are grateful for the donations, messages and shares from all our supporters. Thanks to a sizeable donation from the James N Kirby Foundation, we have raised $107, 395 of our $280,000 goal so far. We would like to express our most sincere appreciation to the James N Kirby foundation and its chairman Helen Kirby - who personally advocated for this project and its Indigenous creators. With just on two weeks left to run on our campaign, we have a lot of work to do. We are speaking with other foundations and trusts and continuing work on our crowdfunding. But we need your help now, more than ever. Whenever you share our campaign, repost from our Facebook page, retweet or tell a friend about our fundraising efforts, you are personally taking a stand against rising suicide rates in Aboriginal Australia. And while a $5 or $10 donation may not seem like much, it all adds up. Warlpiri people often check this GoFundMe page and their comments to me are always about the number of supporters - not the amounts contributed. When you donate $5 you are telling Indigenous communities that you care what happens to them. I know we can achieve this goal together. Thank you for sharing our journey. Thank you to all our supporters. We are in the home stretch of our campaign now with 18 days left to run. We've had a lot of interest from philanthropic trusts and hope to report some good news soon. All of the ground we have gained has been because of your support - your donations, your engagement and your advocacy. I know you've all given hugely of your time and resources, but I hope you will continue to stand with us for the remainder of the campaign. 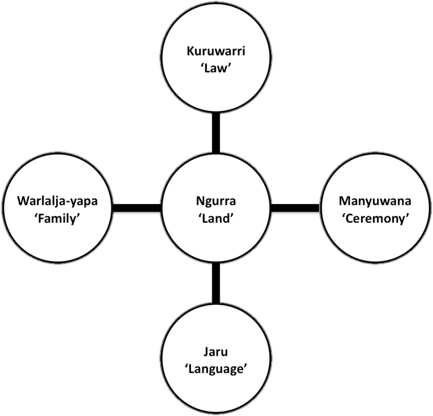 Language is one of the four pillars of Kurdiji - the others being law, kinship and ceremony. Together these pillars create the home within - a centre of stability and resilience for Aboriginal people. Kurdiji 1.0 Aboriginal suicide prevention app will disseminate these central ideas in a bid to save young Indigenous lives. "Our language is sacred to us. Every Aboriginal language is sacred for those who speak it. Words are given to us by the land and those words are sacred. What does it mean to an Aboriginal culture? The land needs words, the land speaks for us and we use the language for this. Words make things happen—make us alive. Words come not only from our land but also from our ancestors. Knowledge comes from Akerre, my own language and sacred language. Language is ownership; language is used to talk about the land. Language is what we see in people. Language is what we know of people—we know of him or her. If they speak my sacred language, I must be related to their kinships. Language is how people identify themselves. Being you is to know your language. It is rooted in your relationship from creation—in your kinship that cycles from then and there, onwards and onwards. It is like that root from the tree. Language is a community—a group of people. Not only do you speak that language but generations upon generations of your families have also spoken it. The language recognises and identifies you, who you are and what is you. Sacred language does have its own language." Thank you to everyone who has donated to this campaign - and who continues to support us by sharing our video. We have been garnering philanthropic support since the campaign began and hope soon to have news of new donations from trusts and foundations. With only 20 days before the end of the campaign, we need your help more than ever. Please let your networks know about what we are trying to achieve, and encourage people to donate. With enough public support we can return power for mental health initiatives to Indigenous elders. Something of the importance of ceremony, one of the four 'pillars' of Kurdiji (along with law, kinship and language) is illustrated in the following video. On 26 October 1985, custodianship of Uluru and neighbouring Kata Tjuta was returned to its Anangu traditional owners. The ceremony remains one of the most significant moments in the Aboriginal land-rights movement. 25 years after the Hand Back Ceremony of Uluru to the Anangu People, a commemorative ceremony was held at Uluru which included dance, music and story. Ceremony is a living, vital and current practice that contributes to the wellbeing and mental health of Aboriginal people. Kurdiji 1.0 will reconnect young Indigenous people with ceremony, kinship, law and language - in order to increase resilience and prevent suicides. Yes, the way is true. We all need remember always that every death be accidental. No other reality. Only by accident can life end. Everybody need know this now. Please can persons making this website tell the old men, I know how important this is, for everybody knowing end of life always accident. 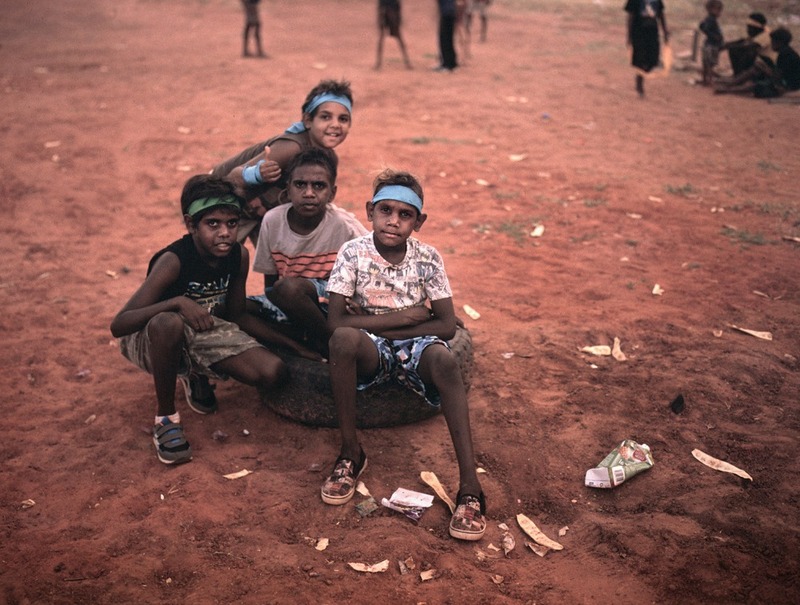 Help us tackle indigenous youth suicide for the cost of a meat pie and sauce. Support our community led project for less than the cost of a smashed avocado breakfast. Contribute to the creation of Kurdiji 1.0 for the cost of a gourmet pizza. Triple digits! Thank you for your generous contribution. Thank you for your very generous contribution. Thank you for your highly generous contribution. Thank you for your extremely generous contribution. Thank you for your outstandingly generous contribution. Thank you for your remarkably generous donation. Thank you for your exceptionally generous contribution. Thank you for your fantastically generous donation! Thank you for your roaringly generous donation. Truly amazing! I care about the future of our First Peoples and our nation. Thank you for thinking of using technology to promote your cultural values and reach young people at risk of giving up their life. May they discover they are precious beyond words, that they can do a lot of good with their energy and time, that no matter who terrible circumstances might be, there is always someone who needs them.